Anhydrous hydrogen chloride (AHCI) is a clear, colorless gas with a very strong odor. Anhydrous HCI is extremely attracted to water and when exposed to air, it quickly reacts with the moisture in the air forming corrosive fumes, commonly known as aqueous hydrochloric acid. This type of acid emits a pungent odor and strong fumes, and has a yellow tint to it’s color. Anhydrous HCI is very harmful if inhaled and causes severe respiratory tract, eye and skin burns. Potential to cause organ damage. Stay away from fumes, and avoid skin contact. Use only with adequate ventilation and proper PPE. When storing anydrous HCI, chemicals must be maintained and routine checks must be completed to ensure worker safety. Anhydrous Hydrogen Chloride (AHCI) is an important reagent used in chemical transformations including the production of vinyl and alkyl chlorides, pharmaceutical products, and the hydrochlorination of rubber. It is used in the semiconductor industry to purify silicon. Other uses include organic synthesis, and cotton separation from wool. Anhydrous HCI has a number of acute and chronic health effects. See potential health effects below. Can cause damage to lungs, respiratory tract, eyes and topical skin. Corrosive to eyes, and skin. Contact with rapidly expanding gas may cause frostbite and/or burns. Extremely corrosive to the respiratory system. If fumes are still present in work or storage areas, emergency response personnel must wear appropriate PPE, including self-contained breathing apparatus, hazmat suit and face mask. Do not give any persons mouth-to-mouth resuscitation if they have been contaminated. For eye contact, check and remove any contact lenses. Immediately flush eyes with water for 10 to 15 minutes. In the event of skin contact, immediately flush skin with water for 10 to 15 minutes. If frostbite occurs, warm up frozen tissue and seek medical attention immediately. Cylinders should be stored upright with valve protection properly in place, and firmly secured with cylinder racks and or rack chains. 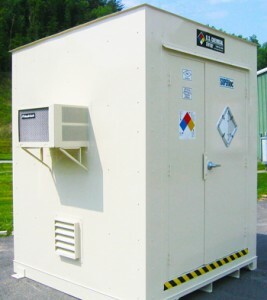 Cylinder temperature should not exceed 125°F, therefore chemical storage buildings should be equipped with climate controlled systems to maintain internal temperature. Mechanical ventilation is also necessary for storing highly corrosive and vapor emitting chemicals. When handling anhydrous HCI, handle inside contained and ventilated chemical storage facilities. Wash hands thoroughly after handling. Do not puncture or incinerate container. Always close valve after each use. When finished handling cylinders place cylinders back in proper storage place to avoid any physical damage. Do not roll, slide, or drop cylinders. Utilize proper hand trucks for transporting cylinders. Praxair. Hydrogen Chloride Safety Data Sheet P-4606. March, 19th, 2015. Niacet. Material Safety Data Sheet Anhydrous HCI. April 2013.